Lacquer must hold mystical powers, as those who have ever admired a fine Russian lacquer box or an Urushi fountain pen will know. Captivating in it’s presence by textures or drawings, yet always finished to perfection with that glossy surface that shows off a soft glow. The stories surrounding the art of lacquer are often equally mystical, such as is the case with Negoro. Born in the Negoro-ji temple, located in the Kishu domain of what is now the Wakayama Prefecture in Japan, it features a basic coat of black lacquer covered by a red lacquer. Although simple yet elegant in it’s appearance, the craft was difficult to master. It was used on everything from tea utensils to tableware to present food offerings to the gods. It was particular popular from the Kamakura to Nanboku-chō period, yet in 1585 the temple was set on fire and the artisans residing there scattered all over Japan in search for refuge, spreading their extraordinary craft as well. 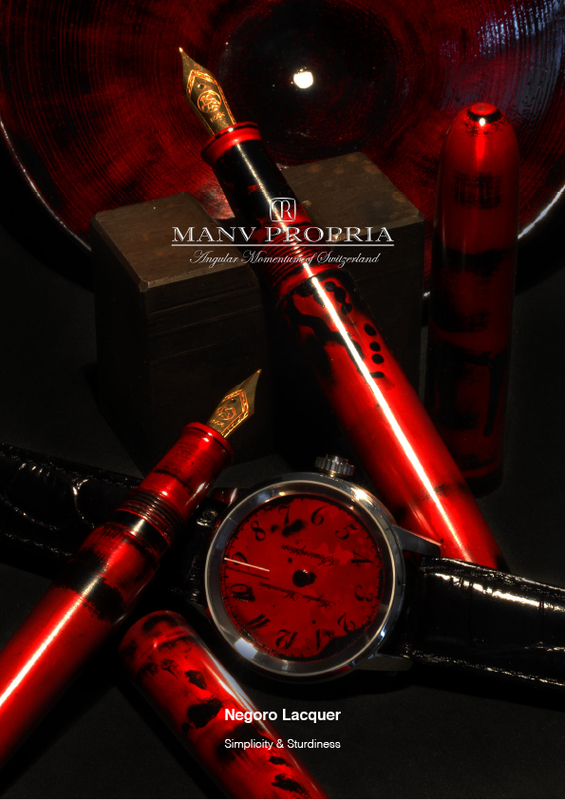 Angular Momentum, the small Swiss manufacture that still creates watches in very limited editions, has had experience with Negoro through a small series of fountain pen’s they crafted incorporating this technique. Now they have introduced it in a wristwatch. Angular Momentum is best known amongst watch connoisseurs for their unique way of telling time. The watch comes without hands, and with this watch it is the dial itself that is turning. The time is read at 12 o’clock, and the precision with which this can be done equals that of a watch that only uses one hand. A fitting watch for those who want to be reminded of the passage of time, but who do not want to live by the second. Displaying time in such a way is also quite fitting to the craft of Negoro, where patience is key to obtaining a perfect result. 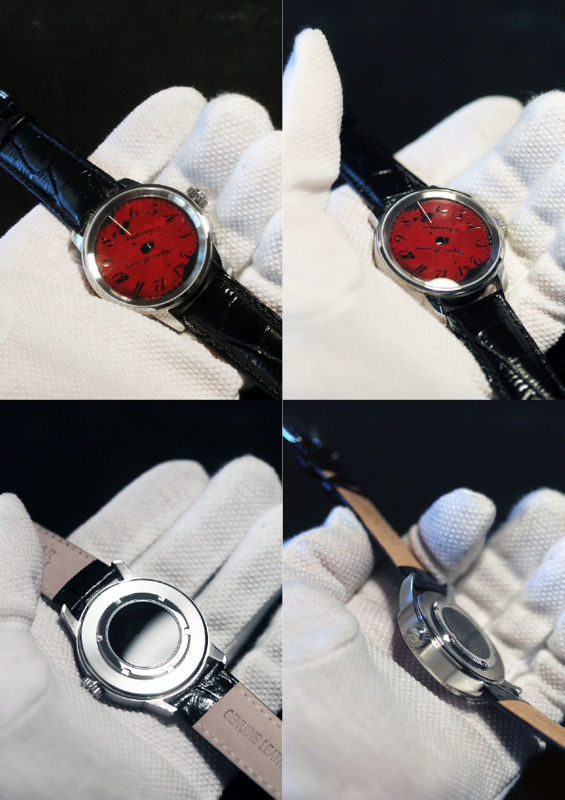 Angular Momentum uses the Negoro to decorate the dial and although they only produce this watch in a very limited quantity, they are actually all piece unique’s since the Negoro can never be applied in the exact same way, allowing for individual variations. Angular Momentum is also a brand you’ve got to love due to their unique approach to watches, and I am talking more than just the way they display time. Unlike, most of the industry, Angular Momentum doesnot use 316L steel for their watches but opts for 1.4435NcU Staybrite steel. Unique about this type of steel, which is actually a Swiss invention, is that it can be polished to perfection. Don’t expect a Manufacture movement in this Angular Momentum as well, nor an ETA or Sellita. In fact what can be found in this watch is a historical movement, the Fontainemelon caliber FHF 96. Fontainemelon was founded in 1793 as a producer of Ebauches, and in 1816 they where already so successful that they exchanged their farmhouse for the first factory. Roughly 100 years later Fontainemelon made 1,000,000 movements a year with 1030 employees, making it one of the more significant movement manufactures in Switzerland. In 1926 Fontainemelon joined AS (Anton Schild) to form Ebauches ltd, to merge, with several intermediate steps, finally in 1983 to the ETA we pretty much know today. With this Fontainemelon forms the oldest part of ETA. 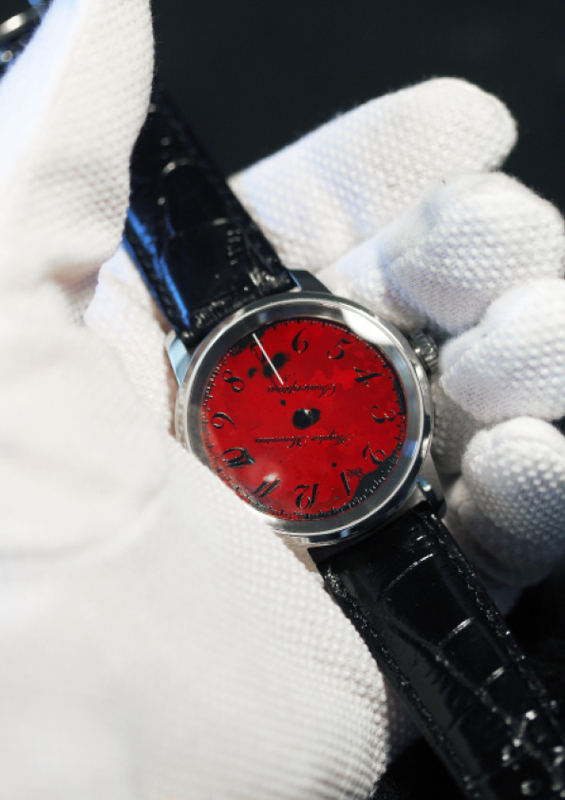 A fitting movement to power a watch like this Angular Momentum, which in any way is crafted with an eye for history!